PROMOTION to Division1B of the National Hurling League is the prize on offer for Antrim’s hurlers at Newry on Saturday when the Saffrons take on Carlow. The sides met earlier in the campaign at Netwatch Cullen Park with that game finishing in a 0-21 to 2-15 draw and another tight contest is anticipated this week wit so much at stake. The sides go into this game with contrasting results in the final round of regular 2A games. Carlow enjoyed a handsome win over Armagh to ensure they topped the group while Antrim fell to defeat at home to Westmeath (see page 93 for report), but having banked enough points earlier in the league as-well-as having the head-to-head tie-breaker over Kildare, they joined the Barrowsiders in the final. 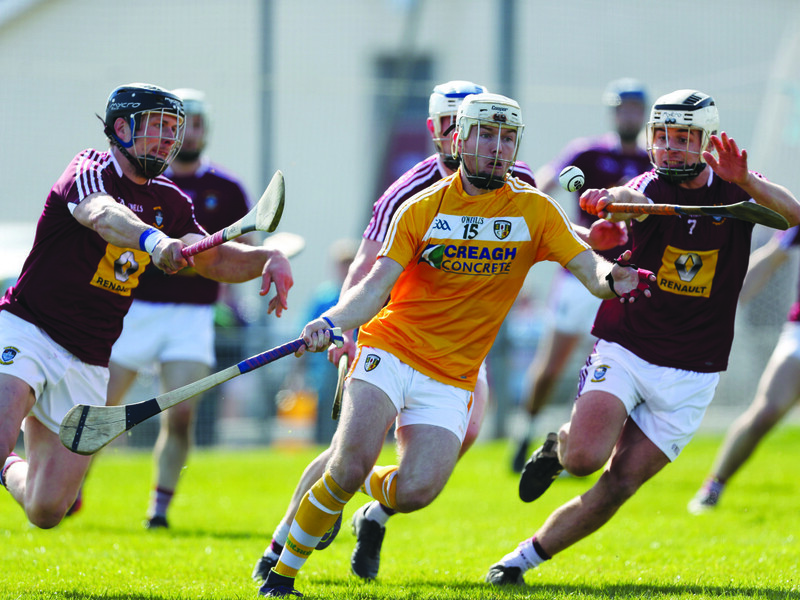 It will certainly not be an easy task for Antrim this weekend as they have not beaten Carlow in their three previous meetings including February’s draw so they will be looking to buck the recent trend against Colm Bonnar’s side. “They are a physical team with a physical half-back line.,” notes Antrim assistant, Neal Peden. “We have to overcome that and we know that. “They had the physicality over us in the drawn game, but our speed boys worked well that day. “It was a good result that day. We could have won it, but we could have lost it too so we were happy coming away from Carlow with the draw in a sense. One man who was on form for Antrim at the weekend was Deaghlan Murphy who hit 0-12 including 10 frees in what was his first senior start and the Rossa man will be hoping for a similar display on Saturday. However, the Antrim management will be looking from a greater return from their other forwards who were off the pace at the weekend and failed to pose much of a threat against Westmeath. In defence, Antrim will be without Ciaran Johnston who was given a straight red card on Sunday so it is likely Tiernan Coyle or Odhran McFadden will get the nod to replace the St John’s man. “Our goal at the start of the year was to be in the final and we have got there,” Peden continued. “That’s where we want to be. We will get a better performance next week, there is no doubt about that. “We wanted out of this league and move the whole thing forward. “We haven’t looked forward or looked at anything else apart from the league. Things have went well for us in the league, they have been trained hard. We aren’t going to knock the boys now, they have worked really hard. Having spent two seasons in 2A, it is crucial Antrim gain promotion in order to make the progress they feel they are capable of and this is their chance to do just that. There is plenty of talent in Carlow however and the Barowsiders will feel they too are primed for a return to face some of hurling’s top dogs next year. With the ground firming up, it is likely we will see an open and high-paced game that could suit Antrim should they use the ball smartly and give their pacey forwards the chance to run at the Carlow defence instead of firing in high ball on top of small forwards that was an issue against Westmeath. It’s in Antrim’s hands however and while they will not get it at all easy at Pairc Esler, they do have the ability to score their first win over Carlow in four attempts.